Modern and contemporary design of the deep shirred v neckline is given a touch of romance with split bell sleeves. A slender spaghetti strap tie detail brings a bit of drama to the deep v open back. 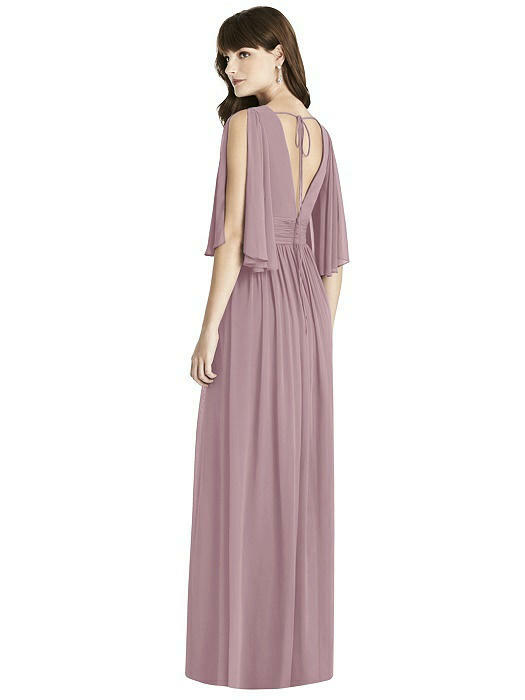 Flirty and charming with a shirred skirt with a center front slit in this lux chiffon full-length bridesmaid dress. Fit Tip: The natural waist and bust measurement take priority for style 6777. If you are over by an inch or so on the hip, you should have enough room to release the side seams to allow for that variance. If you would like help choosing your size, please contact a Dessy stylist.